I don't usually use black when mixing with watercolour, but with a CYMK mixing set it certainly increases the options and is the only way to create some hues and tones. There are 9 inks available in the De Atramentis Document range so far. Yellow, Red, Magenta (also called Fuchsia), Blue, Dark Blue, Cyan (also called Turquoise), Green, Brown and Black. Here you can see each of the colours mixed with black. When the White is available I will do the same with that. Document Fog Grey (which is really a very dark blue) will also be added here soon. It takes VERY little Black to make a change to the original colour so I haven't included ratios for these mixes. Here is Document Yellow mixed with Document Black. It's a lovely bright mid yellow and a strong tinting ink. The Black is really very pure - notice the yellow is darkening rather than turning green as it might with many blacks that are on the blue-side. Document Magenta (also called Fuchsia) mixed with Document Black. There are a few more possible tones between the pure colour and the first mix but I added too much black too quickly. It takes SO little to make a change! Next is the warm Document Blue mixed with Document Black. A nice range of deep blue and indigo hues are possible. Document Dark Blue looks like a mix of Document Blue and Document Black so is already a lovely dark blue. Next is Document Cyan (also called Turquoise) mixed with Document Black, making cooler deep blues. Document Green, which looks like a mix of Yellow and Cyan at a ratio of 1:4, mixed with Document Black makes wonderful deep bottle greens. And finally Document Brown mixed with Document Black to make a great range of dark brown and sepia hues. To see these colours mixed together see the previous post here. Love this and your other DeAtramentis samples shown. Beautiful, useful information. I was just thinking that I would love to have a deep dark blue (almost black) ink and wondering if it is possible to get one exactly in the colour I imagined, but I never thought of mixing two inks together. 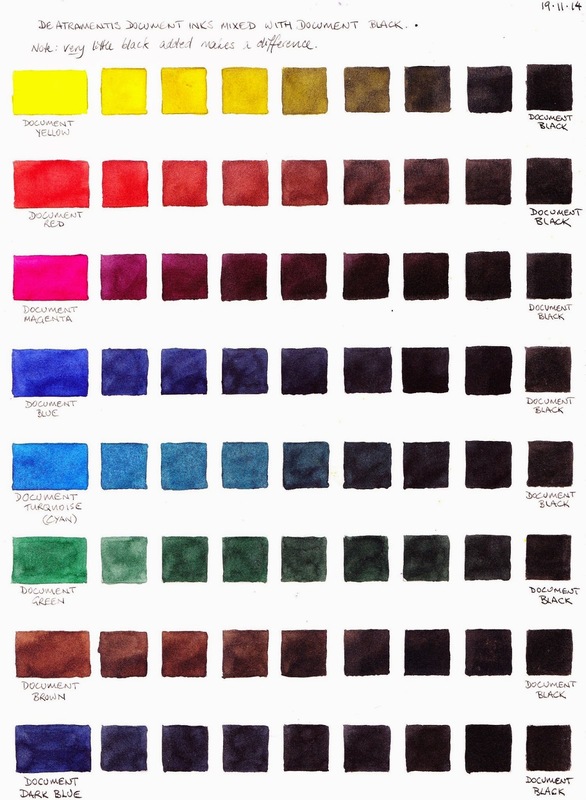 Thanks to your post I know exactly how to achieve my perfect ink colour. Thank you for sharing your knowledge and colour charts. I have often mixed inks, preferably only within one brand, but am very excited about these ones as they are waterproof, lightfast AND fountain pen friendly. Being designed to be mixed, I think they are a game changer in the ink world for fountain pen artists and enthusiasts. I did notice this problem with Turquoise (now called Cyan), and I understand the the manufacturer has made an adjustment to the formula to correct the problem. I have not worked with a new version as I tend to use the Blue rather than Cyan in my mixes. (I love the grey made from Blue and Brown!) I wonder whether you have old or new formula? I'll test with a newer bottle and see if I notice a difference. Love these! What percentage of black did you use with the color? Would love to replicate a cyan black. So little - start with the colour and add a touch and see what you get.